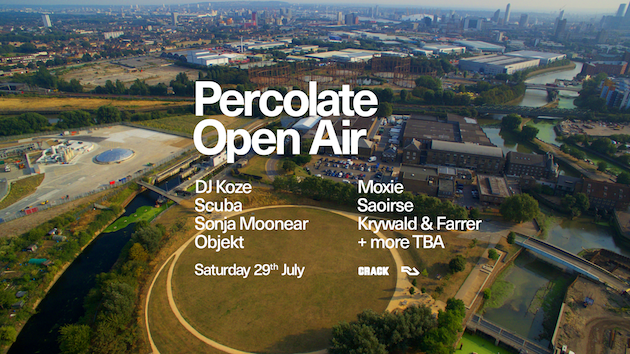 Party promoters Percolate have announced its first ever open-air party taking place at the never before used space of Three Mills Island in Stratford on Saturday 29th July. Taking inspiration from European culture of open-air parties, the one-day event, dubbed Percolate Open Air, is being billed as a high-end, back-to-basics concept that will see the likes of DJ Koze, Scuba, Sonja Moonear, Objekt, Moxie and Saoirse all spinning. Over the last five years, Percolate has turned into one of the country's most loved parties. The nomadic crew deal in classy, quality underground house, disco and techno — roaming the finest venues from London, through Manchester, Bristol, Amsterdam and beyond. Taking place at Three Mills Island in Stratford, the 12th-century tidal mill offers a unique space to host a party that provides both an exclusive and detached feel to the festival site, whilst benefiting from excellent transport links. The organisers are promising “high-end sound, a beautiful industrial backdrop and an efficient queuing system” with two stages and some special b2b performances still to be announced.